The world’s oceans are plagued with the problem of “dead zones”, areas of high nutrients (such as nitrogen and phosphorus) in which plankton blooms cause a major reduction of oxygen levels in the water. Sea creatures need oxygen to breathe just as we do, and if oxygen levels fall low enough marine animals can suffocate. This commonly happens around coastlines where fertilisers are washed from fields into rivers and the sea, but also mid-ocean, where currents trap waters in gyres (large systems of rotating ocean currents). To date most studies have shown that these dead zones have been growing with global warming. 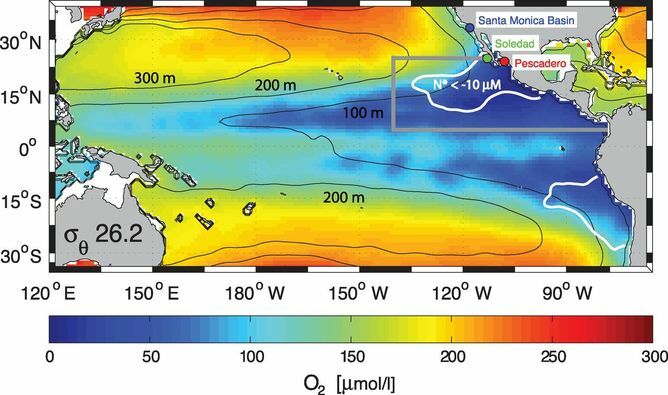 But a recent study published in Science by Curtis Deutsch and colleagues suggests that the ocean’s largest anoxic zone – where there has been a total depletion of oxygen – in the eastern tropical North Pacific, may in fact shrink due to weakening trade winds caused by global warming. The trade winds drive water away from the coast, and the gap is filled by new cold and nutrient-rich waters that come up from the deep. These nutrients trigger algae and plankton blooms upon which larger animals feed, which builds up an accumulation of organic matter. As bacteria decompose this organic matter the oxygen in the water is depleted. This causes low oxygen areas, such as the oxygen minimum zones (OMZs) with very low oxygen content found at intermediate ocean depths. Weaker trade winds would mean less upwelling of these deep nutrient-rich waters, and consequently less plankton and less oxygen depletion. Deutsch and colleagues affirm that although initial oxygen content will be lower due to higher temperatures, oxygen demand will decrease as trade winds do. So, the result would be that low oxygen areas in the tropical north Pacific would shrink. Natural dead zones can be found worldwide, particularly near regions where strong upwelling occurs. These natural dead zones have typically had low oxygen levels over huge lengths of time, due to ocean circulation patterns that prevent mixing. Although these OMZs are natural, they can become larger and more intense due to human activities, such as prolonged and intensive use of fertilizers, changes in land use, deforestation, soil erosion, global warming, and waste waters from cities or industry. All these are well known to cause algal blooms and so drive the expansion of oxygen-depleted areas. In fact, dead zones caused by these human factors have increased over time. Naturally occurring OMZs have also been expanding as temperature rises, so the paper’s prediction that such oxygen minimum zones would shrink flies in the face of previous studies. Animals increase their respiration rates as temperature rises, so they need more oxygen to breathe at higher temperatures. Warmer water also dissolves less oxygen, so as climate change warms the oceans the amount of oxygen decreases, making the effects on marine life even more acute. Warming also encourages water stratification, where the water separates into layers based on temperature or salinity, creating a physical barrier that prevents oxygen reaching deeper waters. Previous studies have predicted a weakening of trade winds in tropical areas, but have also forecasted changes to low-pressure weather fronts over coastlines that would lead to stronger winds, sufficient to replace any upwelling effect lost by weaker trade winds. It seems likely that, in the same way, greater water stratification will lead to a worsening and expansion of dead zones, counteracting any effect the weakening trade winds might have to halt the process of de-oxygenation, and the paper’s authors acknowledge that this is possible. Taking everything into account, it seems that the process of warming oceans under climate change will inexorably lead to larger areas of oxygen-poor ocean, with all the knock-on effects for marine life that entails. Raquel Vaquer-Sunyer does not work for, consult to, own shares in or receive funding from any company or organization that would benefit from this article, and has no relevant affiliations.